With the explosion of consumer demand in the decorated drinkware market, you may be thinking about ways to jump in and cash in. Decorated drinkware is booming. More and more of our customers are finding that this is a market ripe for entrepreneurial energy with low startup costs and healthy margins. We have already written about how to customize mugs and tumblers with vinyl. For full color and/or dishwasher-safe mugs, you may prefer dye sublimation or laser transfer. If that’s the case, you’ll need a heat press. That’s why we added the MP5 Mug Press to our EnduraPRESS product line. The EnduraPRESS MP5 mug press is a great way to gain access to the custom decorated drinkware market. It’s simple, affordable, reliable, portable, profitable, and versatile. Is it really all that? You bet your Yeti. First, let’s cover the basics. 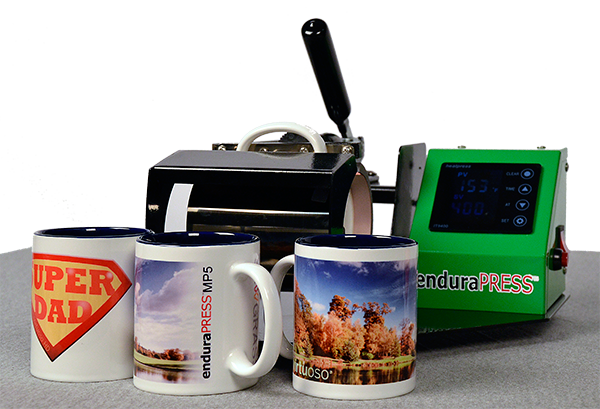 The EnduraPRESS MP5 is a heat press engineered specifically for decorating mugs, tumblers and other drinking vessels. It uses some of the same advanced electronic components as our other EnduraPRESS heat presses, but in a different configuration. It’s a standalone device, not an attachment. So you don’t need to purchase any other hardware. It takes up just under one square foot of table space, which means it’s compact and space efficient enough for just about any commercial or residential work space . And, at only 13 pounds, it’s portable enough to be used offsite at events like trade shows and flea markets. Because it incorporates a digital touch screen LCD control panel it’s very easy to use. 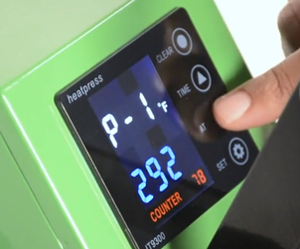 The compact size of the heating element means it heats up quickly and is ready for use in just a few minutes. Using the MP5 Mug press is easy. Just insert the mug, press a few buttons on the control panel, close the press and push the start button. Okay, there are a few details to discuss. As with any other heat transfer process, the key elements are time, temperature, and pressure. Here’s how to set the right parameters for customizing mugs and tumblers. Set time and temperature. Push set button to begin cycling through the page menu. FIG 1. Five page setup menu. You’re ready to go in just a few seconds. • Page one sets the temperature (FIG 1). Use the up and down arrow keys to increase or decrease the temperature setting. • Page two is where you set the cycle time using the up and down arrow keys. • Page three’s arrow keys change the termperature setting from Farhenheit to Celsius. • Page four is for calibrating the temperature display, which is usually not necessary. • Page five controls the preset alarm. This is a nifty feature that allows you to set the timer to go off before the end of the cycle. This gives you time to put your gloves on, get the water ready, or whatever else you need to do to prepare to remove the mug. Set the Pressure: The mug housing of the MP5 can be adjusted for circumference and pressure with a simple thumbscrew. The standard fitting accommodates 11oz coffee mugs. • Pull the lever backward to open the fitting, and slide the mug in. A simple thumb screw adjusts the pressure and opening circumference. Turn the dial clockwise to tighten the seal or counter-clockwise to loosen. • Pull the handle forward to clamp it shut around the mug. If the pressure is too high or too low, open the fitting and adjust as necessary. • When you have the thumbsCrew adjusted to form a tight seal around the drinking vessel, pull the black lever forward and lock it in. • How much pressure is enough? For dye sublimation, you only need enough pressure to form an air-tight seal around the transfer paper. For laser transfer papers, more pressure is needed to bond the toner to the mug or tumbler. Adjust according to your preferred digital decoration method. When you’re ready to start, just push the red button. Just like a Ferrari. Once you get the hang of it, the entire process takes just a few seconds. For a video demonstration of how to use an EnduraPRESS MP5 to sublimate a mug, please click here and view our archived EnduraPRESS Webinar on SIGNWarehouse TV. If you want to jump right in at the MP5 section, go to the Demo section in the Playlist and start at the 3:55 mark. The laser transfer process is almost identical with a couple of twists. Laser transfers call for a lower temperature, and shorter cycle time settings, but higher pressure and a slightly different cooling process. Plus there’s an extra step to oven cure the toner . Click here for details. One of the other exciting features about the EnduraPRESS MP5 is the availability of optional fittings that allow you to decorate lots of different sizes and shapes of drinkware. Large and small mugs, even big conically shaped vessels are easy to sublimate with the various fittings. This is a feature not found on brand name products that cost a lot more. Just one more way the EnduraPRESS product line delivers exceptional value. Read all about the MP5 mug fittings here. We mentioned above that the MP5 is both affordable and profitable. That’s a very attractive combination. Although it doesn’t cost much, it can help you generate lots of revenue. In fact it’s so affordable and profitable that you can easily generate enough profit to pay for itself in just one case of mugs. Sounds like a bold claim, doesn’t it? Let’s crunch the numbers. Let’s start with how much the finished product is worth. Currently, decorated mugs are being sold online at prices ranging from $6.99 on Ebay and Amazon to $13.99 on Etsy. That’s a pretty broad range reflecting the fact that different markets attracts different kinds of buyers. Choose your channel based on the kind of buyers you want to serve and the best fit for your business and design persona. After determining how much the finshed product is worth, the next question to answer is, how much does it cost to make. The MP5 can be used with dye sublimation or laser transfer, so it pays to examine both methods. These are similar processes with similar cost structures. Sublimation: Sawgrass says the average SubliJet HD ink cost for a letter size print from a Virtuoso SG800 is 63¢/sf. The square foot ink cost for the SG400 is $1.08. Since a letter-sized sheet of transfer paper is much less than a square foot, the ink cost for an actual mug-sized print is much less. We’ll skip some of the math and present the short summary. • SG400 ink cost, $60¢. Paper cost = 4¢/sheet. Total ink & paper cost = 64¢. One sheet of paper can yield 2 full wrap or front & back mug transfers. Ink & paper cost/mug = 32¢. SG800 ink cost, $34¢. Paper cost = 4¢/sheet. Total ink & paper cost = 38¢. Ink & paper cost/mug = 17¢. White polymer-coated mugs are widely available for about $1.35 each or more. Adding the mug cost to the ink and paper cost produces a total material cost range of $1.52 – 2.32 each, depending on which printer you use and where you buy your mugs. Laser Transfer: The profit picture for laser transfer is similar with a few differences. Toner costs less than ink, and laser transfer can be used to decorate plain mugs (no polymer coating required). So the toner and mugs are less expensive. But the self-weeding hard surface transfer paper costs more than standard sublimation transfer paper. Here, we don’t have to use estimates based on square feet. The TransferRIP Cost Calculator can tell us the exact cost in toner and paper for any job we process. Here’s the breakdown. iColor 500 toner & paper cost for 3″ x 9.5″ full wrap mug transfer (Fig 2). Toner cost = 24¢. Paper cost = 59¢/sheet. Total toner & paper cost = 83¢. Toner & paper cost/mug = 42¢. Laser transfer doesn’t require polymer coated mugs. We’ve decorated uncoated dollar store mugs with ICHHARD paper. So your cost per mug could be as low as $1.00 a piece. Total material cost, $1.42 / mug. Bear in mind that these profit projections are based on conservative prices for your products. Selling commemorative mugs at live events or adding photos of children or other loved ones adds intrinsic value and commands a higher price. Choosing the right market can have a big impact on your bottom line. But even at the lower end of current online prices, a simple mug press is a good investment. Since the EnduraPRESS MP5 is regularly available for less than $200.00, you can quickly recoup your entire investment with just a one case worth of custom or short run mug sales. With the growing popularity of decorated drinkware, an EnduraPRESS MP5 mug press is a great way to launch or boost your startup digital decoration business. The profit potential supports quick return on investment. The MP5 Mug press offers outstanding features like advanced electronics, ease of use, and with the optional fittings, class-leading versatility. Plus the EnduraPRESS brand adds the support resources and peace of mind that come from dealing with an industry leader with a 35 year track record of delivering outstanding value.